According to the Italian Embassy in Brazil, "Italy and Brazil have their Histories strongly linked". The first Italian Ambassador, Gabriele Galateri di Genola, arrived in Brazil in 1859, even before the modern Italian State had finished Reunification (see History of Italy). Still according to the Embassy, the first Italian immigrants arrived in 1875. Today, there are nearly 300,000 holders of Italian passport living in Brazil, and nearly 25,000,000 people with Italian ancestry (oriundi). About 10,000,000 oriundi live in Sao Paulo; this makes Sao Paulo's the largest Italian community outside of Italy. The peak of Italian immigration occurred between 1870 and 1920; at the time, Italy was still suffering the pos-Unification problems, and many peasants were facing extreme poverty. The Brazilian Government (then an Empire) was already preparing the Economy for the end of Slavery (which eventually came, in 1888), and the Italian workforce was seen as a replacement of the black slaves; besides, Italians were white skinned and Catholics, two qualities sought by the Brazilian Emperor. According to this source, between 1870 and 1920, out of a total of 3,300,000 immigrants who entered Brazil, 1,400,000 were Italian. Even though the first immigrants had been directed to the Southern States of Parana and Rio Grande do Sul (where they would work in their own colonies), soon the coffee farms of Sao Paulo (coffee plantations was a nearly monopoly in Brazilian Economy) started to attract the Italians. 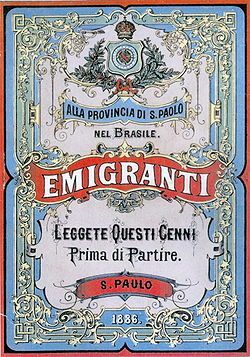 After 1890, most Italians coming to Brazil would come to Sao Paulo. Like all other nationaliteis, the Italians were directed to the Inn of Immigrants, where they were identified and then sent to the farms. The Inn was refurbished and today houses the Immigrants Memorial (photo to the right). Even though they were supposed to work in the coffee farms, soon things started to change. Brazil was experiencing the start of industrialization. The Italians learned fast the crafts necessary to work in the factories. 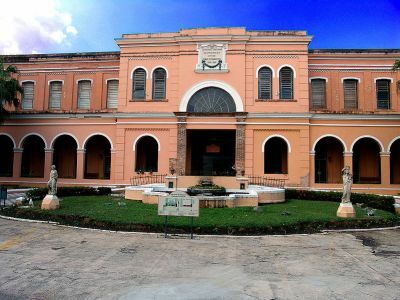 With dedication to study and hard work, soon they were gaining importance in Politics (the first Union leaders in Brazil were Italians), Economy (Francesco Matarazzo arrived in 1881 as a poor peasant, and became the richest man in Brazil), Culture and more. So, what's to be seen of the Italian Heritage in Sao Paulo today? » Pizzas. Sao Paulo has 6,000 pizzerias and eats 1,4 million pizzas daily; the pizzas rank amongst the best in the World. » Neighborhoods. Mooca and Bixiga usedo to be the main Italian districts; Achiropita Festival has been celebrated for nearly 100 years. » Football. Palmeiras was founded by Italians, with the name Palestra Italia; after World War II, the team was forced to change name. » Culture and Education. MASP was created by an Italian. Dante Alighieri is one of the most well regarded schools in Sao Paulo. Italian architects designed buildings like the Italia Terrace (which was for a long time the tallest building in Sao Paulo) and countless churches like Saint Genaro's.